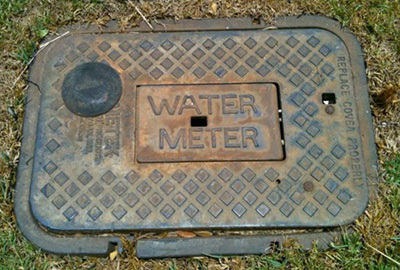 A water meter is measures the quantity (volume) of water that passes through a pipe or other outlet. Typically, meters use a standard unit of measure for volume, such as cubic feet or gallons. Your meter works like a car odometer, recording the cumulative amount of water that has passed through the meter. WUM records every reading, and subtracts the old reading from the new reading to determine the amount of water used since the previous read. By understanding how to read your meter and calculate your usage, you will be able to verify that we are reading your meter fairly and accurately, and to spot problems, such as leaks. WUM reads meters to calculate bills, and to prevent water loss. You should read your meter too. 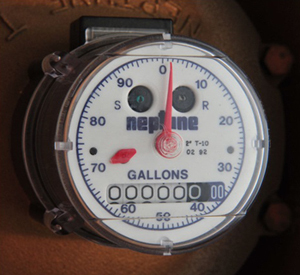 Reading your water meter regularly will help you understand your bills, and to understand how you are consuming water. You can determine how much water you typically consume over a period of time by keeping a simple log. You can also determine the amount of water used over the course of an event, such as an irrigation cycle. Finally, you can detect water flowing that you are not intending to use, such as a leak or water theft. Checking readings periodically will help you to catch any problems, before WUM reads the meter to calculate a bill. Regular reading of your household meters (water, electric, or gas), will make you a more educated consumer, and will put you in a position to ensure your meter is properly read by the utility company. Reading your meter periodically and recording results helps in water conservation practices and in identifying water leaks early. Follow the leak check procedures below to find out if you have a leak! To read your water meter, you’ll have to find it first. Most meters are located in your front lawn, near the curb or sidewalk though some can be in a side yard, or even back yard. They are in a “box” with a metal or plastic lid that reads “Water” or “Water Meter.” To remove the lid, use a long metal screwdriver, and pry gently from the side of the box. Wear gloves for protection, as the lids are often hot, and because meter boxes become natural homes for wildlife, including insects, frogs, and even snakes. We operate meters that have a digital read-out, or an Analog readout. Either type may also be read with a radio. Follow the appropriate reader specific steps below. Unit of Measure – WUM provides both meters that measure in cubic feet and meters that measure in gallons. 100 cubic feet of water is equal to 748 gallons of water. Does your meter read in gallons or cubic feet? *Ignore the digits following the decimal point. Those are only used for leak detection. This meter reads that 34,215 cubic feet of water were used since the date of installation. To calculate cubic feet to gallons, multiply the number of cubic feet by 7.48. 34,215 ft3 * &.48 = 255,928.2 gallons Now we know that 255,928.2 gallons have been used since the date of installation. This meter says that 5,628,340 gallons have been used in total since the installation date. Turn off all indoor and outdoor water appliances. Don’t forget icemakers and irrigation spigots. Also, do not turn on any water during this test. Learning to read your meter: There will be two different numbers that display on your meter. They are the meter read and flow rate. The meter read is the total amount of water used since the installation date. It will always be the larger number. The other number that will flash on the screen is the flow rate. This is how much water is flowing currently. After turning off your water, record the meter read on your odometer. This will be your 1st Reading. * *When all water is off, if the flow rate is not 0, then you have a small leak. Wait 20 minutes. This is the minimum amount of time needed to give you a clear read. After the 20 minutes have passed, go back to your water meter and take another reading of the numbers on your “odometer.” This is your 2nd Reading. If X equals 0, and your low flow indicator is not moving, then you do not have a leak. If x is any number greater than 0, but all water utilities are turned off, then you have a leak. After you have logged your water usage, if you still cannot determine the reason for your increased water usage or water bill, please give us a call. Some of our digital meters allow us to pull a “log” of past water use. Call us if you would like us to capture this log. * *There may be a small fee. Some leaks may only appear at higher pressures and “disappear” during lower pressures. If you suspect a leak, keep monitoring over a long period of time. Record your water use intermittently and keep a log of your usage. A classic example of a leak that may not appear immediately is a sprinkler head that does not always set. 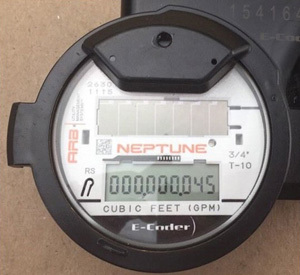 This meter reads that 34,215 cubic feet of water were used since the date of installation. To calculate cubic feet to gallons, multiply the number of cubic feet by 7.48. 34,215 ft3 * &.48 = 255,928.2 gallons Now we know that 255,928.2 gallons have been used since the date of installation. After turning off your water, record the meter read on your odometer. This will be your 1st Reading. * *If you see that your low flow indicator is moving while all water is turned off, this means that you have a very small leak. After the 20 minutes have passed, go back to your water meter and take another reading of the numbers on your odometer. This is your 2nd Reading.